Several days ago I was practice riding the course for Round 2 of the New Zealand Mountain Bike Championships, to be held on Mt Victoria here in Wellington this coming Sunday. 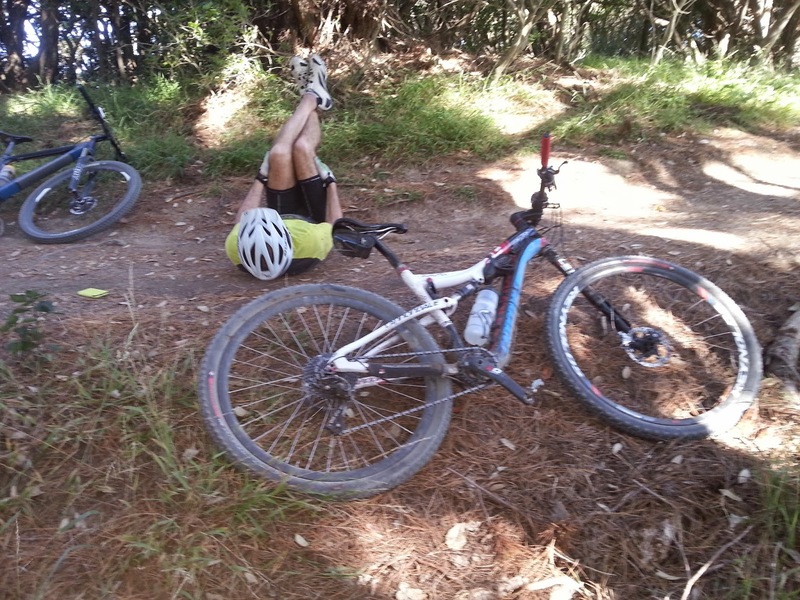 I was in great form, handling the steep declines, scary drop-offs and brutally steep climbs. I was confident of an age group podium finish. But this was not to be and my plans to contest the World Championships later in the year were about to be dashed. It all came apart as I crested the summit of the biggest climb and entered a gentle left hand turn. My front tyre slid on a patch of pine needles, which was not a problem as I expertly planted my left foot to correct the skid. 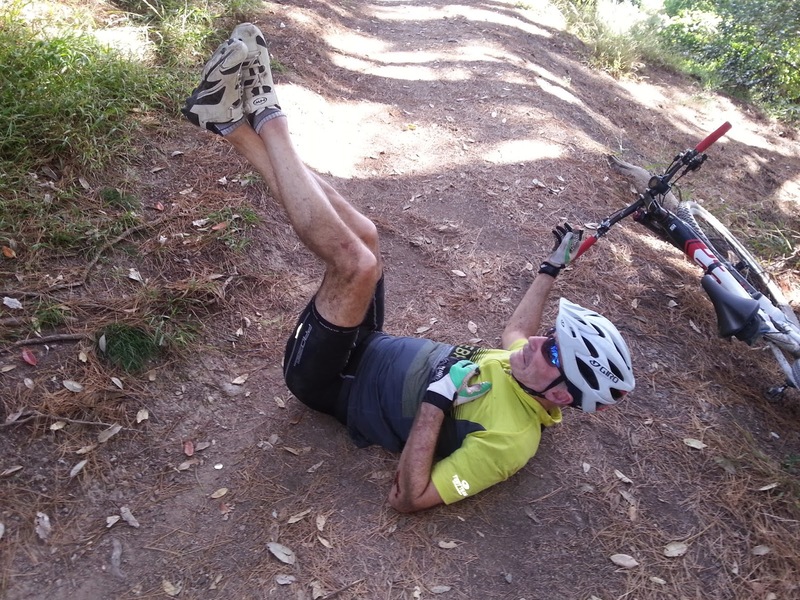 Problem was that the bike and body kept gracefully sliding while the foot stayed where it was planted! (Pine needles can act like fine needle bearings when on top of dry clay). I had violently ripped my foot off my ankle, shattering the bones and ripping ligaments in the process. Needless to say, the pain was beyond description. Despite the agony, being a naturally positive person and a blatant opportunist, I realised this was the perfect scenario for an article on the practical application of emergency sports medicine. (I wrote the original ACC guidelines for Ice, Compression and Elevation (I.C.E) back in 1979 and had been thinking of doing a personal update about now). 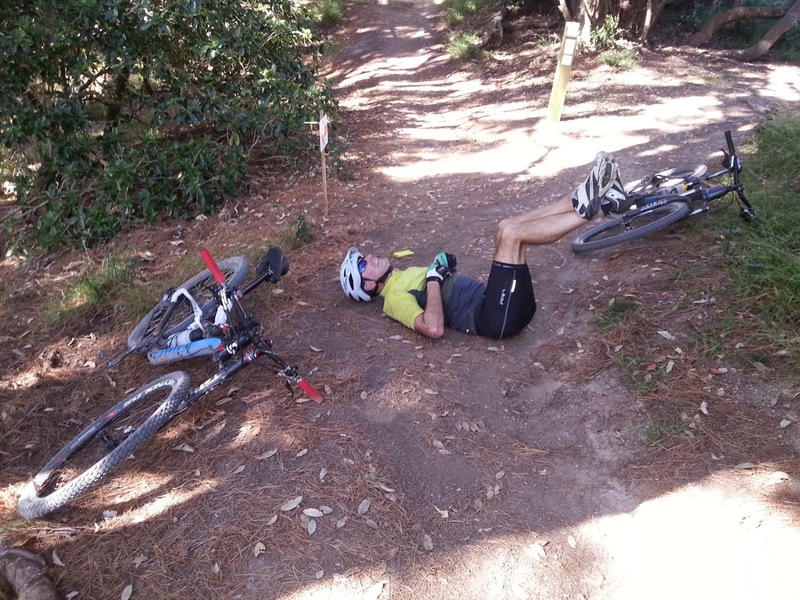 So, my first request of the cyclist who came across me lying on the trail was to call the ambulance; the second was to have him take photos. Let me explain why first aid is so important in cases like fractures and dislocations of limbs. Bleeding is enemy of treatment and recovery! When there is severe trauma to a limb, in this case, the ankle, there is immediate and profuse bleeding into the joint and tissues from the ruptured blood vessels. If this is allowed to happen the blood and swelling can be so much that surgery must be delayed, often for weeks, because of the mess inside and also because it is impossible to stitch flesh and skin, if an incision is made such as to put in a plate and screws to stabilise a fracture. Also, the earliest stages of healing involves the removal of congealed blood and debris from the site of injury. The more blood in the wrong places, the longer the recovery and increased risk of complications such as blood clots. Yes, the laying down of new tissue to replace the damaged tissue can not commence in earnest until this process of clearing the building site of debris is complete. If there is a lot of congealed blood, healing will be delayed - slowed down by weeks. So you will gather why it is essential to minimise the bleeding and swelling right from the moment of injury. Notice the crooked left ankle. Immediate elevation after falling to prevent bleeding into the joint. I am writhing in pain and making a lot of noise while having a great ab workout. The next time you cut your finger do this: Raise the cut finger above your head. It will stop bleeding. This is because the heart is designed to pump blood no higher than the top of your skull, although I would swear there are many people where the blood flow stops at about neck height! So, the first and only action necessary to stop bleeding and swelling post injury is to raise the damaged limb as high as you can comfortably do so. Do not bother with ice and only add compression if it is convenient to do so. In my case, I did not add compression because we had nothing suitable until the paramedics arrived an hour or so after the accident. Clotting of blood to seal off ruptured blood vessels is well underway by about seven to 10 minutes; however it is necessary to keep the limb elevated and motionless for the best part of an hour to ensure the blood vessels are sealed. Anything other than gentle movement over the ensuing 36 or so hours may induce further bleeding, so the priority over the first 3-4 days is rest, elevation and immobilisation. Thank goodness the bike's okay. You may be wondering why I have not had someone prop my leg up on my bike. well, I felt I needed the extra workout and, besides, these photos were taken immediately after the accident. Getting the photos was the first priority. My foot was propped up later. After an hour of lying there I was thinking that this was really good ab work! Nice shot of my flash bike, by the way. Thank goodness you can't hear what I am saying! One very crooked left foot but note the lack of swelling. The shoes are lightweight Northwave brand - I can highly recommend them for grip. As an aside, while lying in that spot for over an hour, the best part of a dozen people walked past. At times I was alone while the two very helpful and caring cyclists, Jodi and Hamish, went searching for the paramedics who had gotten lost. What astonished me was the number of people who walked past without even asking if I needed help, one even almost stepped over my head to get past, while I noticed another walker avoided me altogether by taking an off-track diversion! Only a few asked if I was okay and one did stop and insisted on constructing a platform out of some branches so I could keep my leg raised - thank you. On the positive side, the ones who helped, or offered assistance, more than offset those strange and uncaring people. A pillow was folded and fastened around the ankle and foot by the paramedics. Bear this in mind if you ever need to stabilise a fractured or dislocated limb. The soft pillow method is more comfortable and safer way to stabilise a fracture for transport than trying to fashion a splint. I didn't quite succeed in ripping my foot off my leg, but made a good attempt at it. While moving about I did not want the pain to be dulled to the point where I might inadvertently cause more damage. 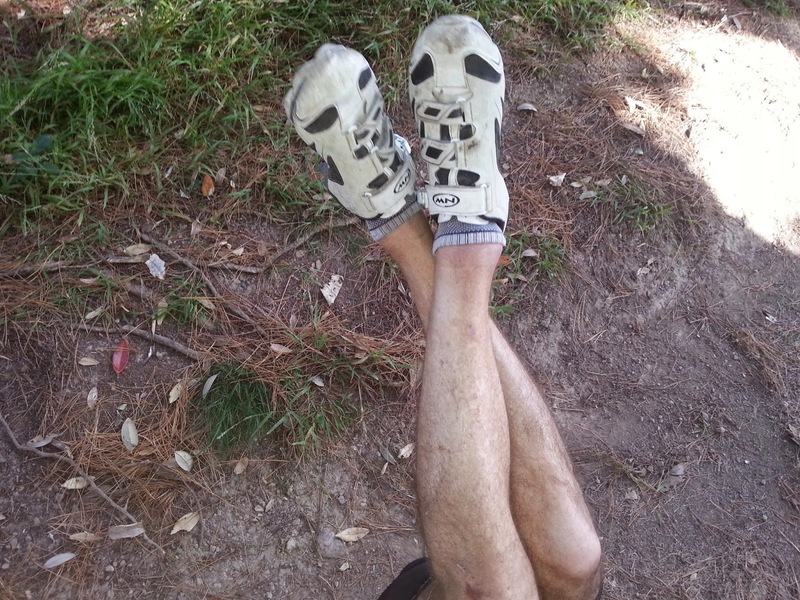 Pain has guided my rehabilitation from Day One, telling me when it is time to stop and put the leg up for a rest. It also tells me when to shift position, thus avoiding pressure damage to the wounds. Pain medication, such as Voltaren, is renowned for the damage it can cause to the digestive tract and to the liver. I was aware from the moment of the injury that a healthy digestion and strong liver were going to be essential for a quick and full recovery. Bear in mind, as well, that the liver was about to have to deal with various potent drugs such as the general anaesthetic, pain medication and antibiotics during and after surgery - and also the detritus of dead tissue over several weeks. So, yes, I did take pain medication but very little indeed as compared to most. So long as I got a reasonable sleep, I did not mind some pain. I was careful not to incapacitate this life-saving feedback system. The pain was terrible at times, but I kept reminding myself that "Pain is in the head" - not completely true but a good line to keep repeating while in pain! I think, as well, that the extreme athletic conditioning I have done over the years has endowed a good pain tolerance. 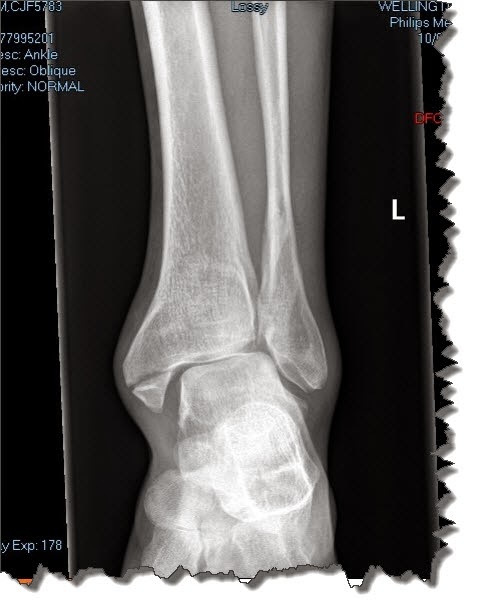 When I arrived at the hospital the orthopaedic registrar advised that surgery may have to be delayed because of swelling (he could not see the ankle other than from the xrays because of the bandaging). I responded by saying that there was minimal swelling. He was sceptical. Fortunately, I was right; there was minimal swelling and I was the first patient to enter the operating theatre the following morning. My first aid action had paid huge dividends by preventing any delays in surgery. During the two days of postoperative recovery in hospital, I had a very interesting man lying in the bed next to me to keep me company (I should be more careful about how I said that - he was in the bed in the adjacent cubicle). He had fallen off some scaffolding and suffered a nasty fracture to his heel and severe bruising to the backside and a tailbone fracture. While it was not as serious as my injuries, he was going to have to wait for about three weeks for the swelling in his ankle to go down before they could operate. In contrast, by being right on the ball with the first aid from the second of my injury happening, I had reduced my recovery time by at least three weeks. Because I had dislocations that could not be reduced under local anaesthetic (two excruciating attempts were made), surgery was quite urgent meaning that I was first in line in the morning (my injury was late Saturday and, by the time I had gone through accident and emergency and had the initial exams, it was late at night). I went under at 8 am Sunday and was out around midday, which was surprisingly long but indicative of the care of the orthopaedic surgeon, Mr Mark Sherwood, and his team. I have the feeling that a good job was done. However, I must say I was still a little shocked at the amount of metal that was required to put my leg back together. I had made a real mess of my ankle. My quest to win the world champs has just become a whole lot harder. 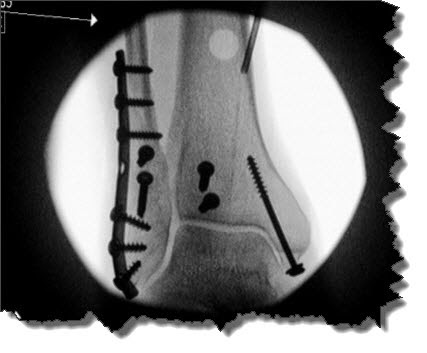 It is easy to understand from the xrays why there can be no weight bearing for several weeks. There are enough screws to hold down a Wellington roof. Oh dear! even more metal. What a mess and no wonder the surgery took so long. A welcome recovery cuppa along with some oxygen. One very sore leg. Readers will know that I can be very critical of the direction of modern medicine when it comes to dealing with many of the diseases associated with ageing, lifestyle and nutrition. Readers will also be aware that I praise emergency medicine. There is no better time in history than now, to be run over by a large bus, or to fall off a bike. Medicine's ability to resuscitate and repair a broken body is mind-boggling. Its impressive. I had no hesitation at all to undergo the surgery (I also had no choice!). By the way, New Zealand has an excellent reputation when it comes to orthopaedics. 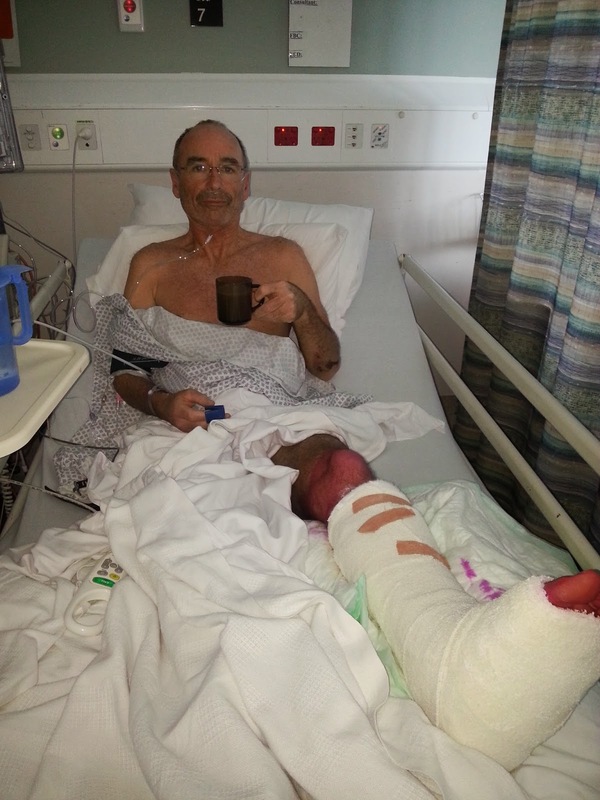 Two days were spent in hospital recovering from the operation which appears to have gone well. The surgeon has advised that I will be in plaster with no weight bearing for at least 6 weeks after which there will be an initial period of recovering movement in the ankle which will be stiff and sore. He advised that full recovery may take as long as 18 months and there's a high probability that I will suffer osteoarthritis later. Looking at the damage I would tend to agree with this advice, the duration and long term prognosis. It makes for a good challenge. 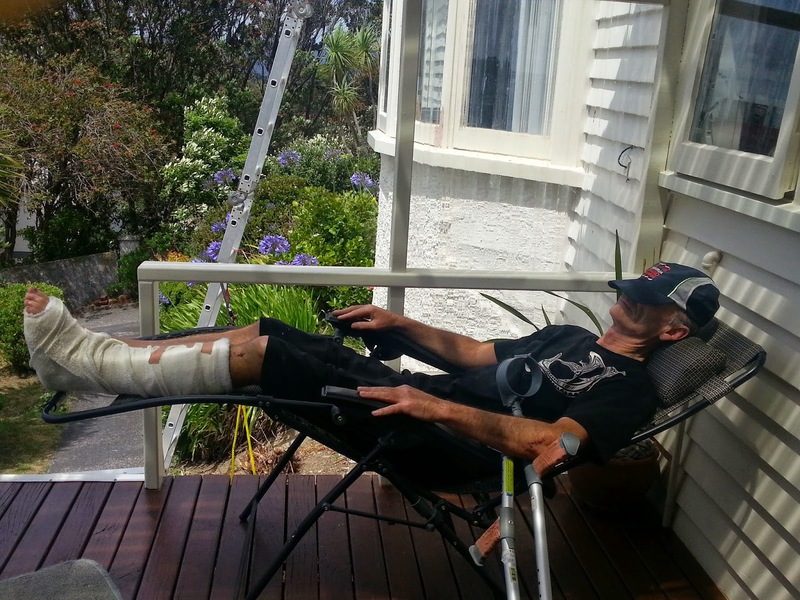 My rehabilitation goals are to make a 100% recovery, that there will be no long term limitations from arthritis and to win the World Masters 60+ Mountain Bike Championships in 2016. What am I doing to make these a reality? The first six weeks is all about giving plenty of time for the body to repair the damaged structures to the extent there will be sufficient stability in the bones for weight bearing. 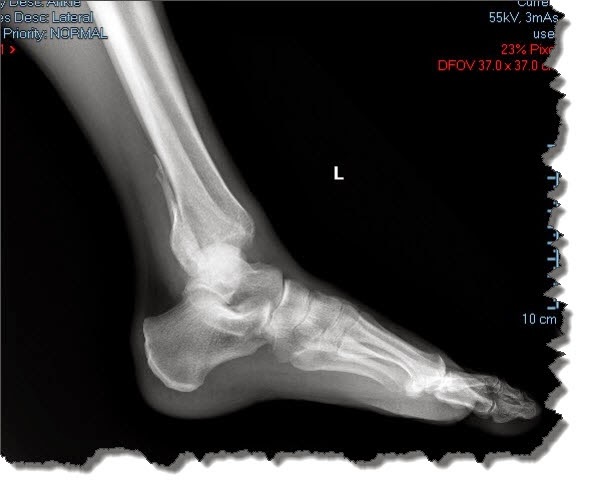 Much damage has been done to the left foot and ankle and there is nothing to be achieved by pushing it. In addition, I have suffered general physical and emotional trauma the magnitude of which can easily be discounted: I need time to recover. I am playing a long game - no quick fixes. No arthritis later on. I will be guided by pain, swelling, intuition and the advice of specialists as to how hard I push things. Rest assured the process will be careful and conservative. While this may appear an idyllic way to pass the work days, rest assured that the novelty is quickly wearing off! This reclining position facilitates venous and lymphatic drainage of the leg and I'll be doing this for the best part of the next six weeks, while gradually introducing some active rehabilitation in between. Reducing secondary tissue damage from oxidative stress from the toxins released by dead and dying tissue. This is principally done by flooding the body with a mix of super antioxidants such as Algotene. Assisting the eliminative processes, principally the liver and kidneys, with expelling the detritus and toxins resulting from the trauma, surgery and medications. Supplying the nutritional building blocks for bone, ligament, cartilage, muscle and new blood vessels. AST Serracor and AST Peptizyme which are a mix of revolutionary systemic enzymes that boost metabolism, improve circulation as well as dissolving and removing cellular debris, including actively dissolving fibrin (blood clots). One of the enzymes, serrapeptase, dissolves old scar tissue, creating cellular spaces for new tissue to be laid down. Amazing! Allergy Research Group Tocomin which is a rich formulation of mixed tocotrienols (members of the vitamin E family) which have novel bone-building properties as well as being powerful antioxidants, anti-inflammatory and circulation promoting. I have used this for the successful reversal of osteopaenia and healing of stress fractures. InterClinical Laboratories Reparen which is calcium phosphate monobasic. Calcium phosphate monobasic is concentrated at the site of tissue healing, particularly of bone, tendons and cartilage, as well as muscle. It is particularly valuable for bone healing. I have used Reparen for years for helping recovery from soft and bony injuries such as stress fractures. InterClinical Laboratories Algotene. Algotene is a remarkable marine phytoplankton which is adapted to survive in the harshest UV radiation found on planet Earth. Taking algotene helps to protect my DNA from radiation damage. I have had far too many xrays lately and more are to come. Algotene also happens to be an internal sunscreen, allowing me to spend more time out in the sun generating bone-building natural vitamin D. Algotene is a powerful anti oxidant. I am also taking quite high doses of vitamin C with echinacea to aid tissue healing. I am also taking the potent Naturopaths Own Probiotic and Immune Repair powder for the next month or so because I had three infusions of powerful antibiotics while in hospital. My answer is "of course not! When we are young we can eat almost any kind of rubbish and pretty much get away with it. As we get older what we eat becomes more and more important. As ageing sets in and nutrient deficiencies become more accentuated, healing and health in general become more and more compromised. Much of what we consider to be the uncontrollable consequences of ageing are, in fact, controllable nutritional factors, many of which can be slowed and even reversed. Slow and incomplete healing is the most obvious of these controllable factors. High quality nutritional products are not cheap to buy. Actually they are very cheap, really, if you were to take away the billions of dollars of subsidies given to non-nutritional treatments such as patent medicines. There would be little change out of $30,000 for the surgery and the time spent recuperating in hospital. 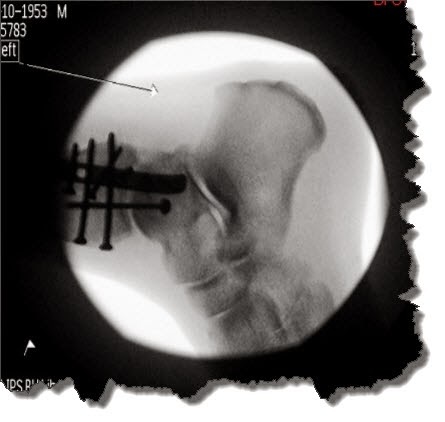 Then there are the follow up consultations and likelihood of more surgery to remove one or more of the metal bits and pieces. Then there is the lost time and productivity from my work. And what's the cost of an arthritic ankle a few years from now? Maybe I can avoid this by investing now, including in my nutrition? If, through spending a few hundred dollars on nutritional measures, my recovery is quickened by even a few weeks and the possibility of arthritis a little less than it might otherwise have been, then the payback is well worth the investment. a great athlete is merely a very healthy person! When sitting or standing with my leg down, blood is pooling in the damaged leg. This is because the venous flow is compromised due to swelling, damage to the vascular bed and lack of the muscle pump since the leg is immobilised, whereas the arterial flow to the legs has not been disrupted. Pressure builds as this pooling happens and this shows as a rise in blood pressure as the heart works harder to try to circulate the blood through the squeeze point of the left leg. Raising the leg so that the blood begins to drain shows a steady reduction in blood pressure towards 110/70. It is possible, as well, that stress on the liver and kidneys will be pushing blood pressure up, however I think this is minimal in my case because blood pressure quickly returns to normal once elevation is resumed. The brown colour of the urine indicates that my body is now working hard to filter and remove the cell debris, including haemoglobin and myoglobin, which will be producing the brownish urine. These wastes are excreted via the urine and the bile and the less than healthy bile can upset the tummy and cause nausea. The circulating waste and the strain on the liver and kidneys, which are the principal organs of elimination, can cause the person to feel very tired. I'm managing these symptoms first by lots of rest and elevation. You can't ignore the need for rest. Its essential during this initial stage of recovery. I'm supporting the processes of removing dead tissue with various supplements including antioxidants, vitamin C and systemic enzymes (refer to the earlier section about nutrition). I may also do some specific liver support such as adding milk thistle if things become more uncomfortable than they are. I am also having a few tablespoons of apple cider vinegar in a large glass of lemon water a couple of times a day. The largest organ of your body is the skin and sweating can be used to aid the elimination of toxins. I would normally use a sauna for this, but am inducing a really good sweat by soaking in a large hot bath with a couple of handfuls of Epsom salts (magnesium sulphate) added to the water. I'll be writing about this in a few weeks, once I have had my follow up appointment with the orthopaedic surgeon, Mr Mark Sherwood, so please come back soon for the latest update. I don't want to get too far ahead of myself. In the meantime, once I am over the initial shock of the accident and its aftermath, I'll be progressively working to maintain my hard-earned fitness and not to lose it. I've already worked out how to do this and its ready to roll (More about this soon). 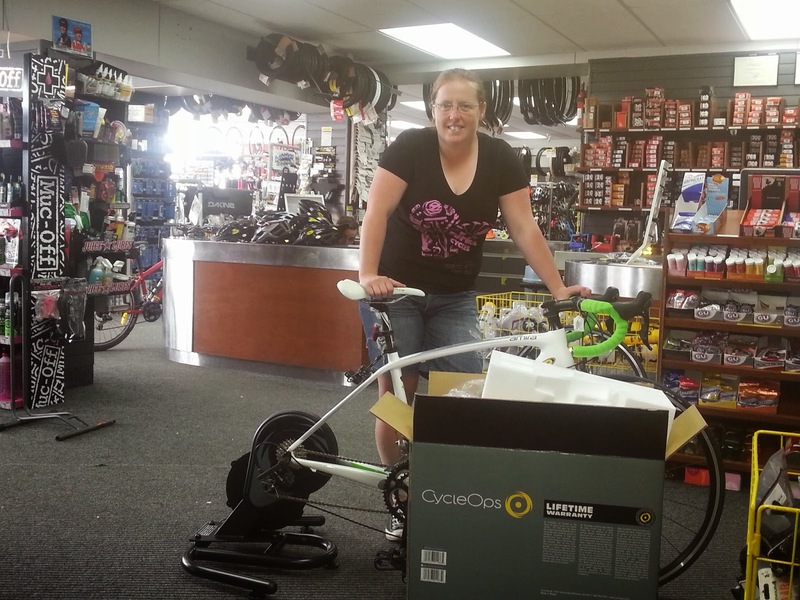 Jodi from Burke's Cycles Kilbirnie, unpacking and testing the silent, super-duper CycleOps trainer. Wow - it comes with a lifetime warranty! I'll be commissioning this beauty in a few days time using a special single leg cycling kit supplied by NZ Cycling coach, Andy Reid. By the way, Jodi is the person, who, along with Hamish, came to my aid when I shattered my ankle. She earned the sale!